The Royal Gorge Area features the Arkansas River, 2 national fossil sites, a scenic byway, the Royal Gorge Bridge and a tourist train. Cañon City has a rejuvenated downtown shopping district and the Arkansas Riverwalk Fitness Course, making this area a great vacation destination with more than 300 sunny days a year. The Royal Gorge Bridge, built as a tourist attraction, opened in 1929 and spans the gorge with the Arkansas River 956 feet below. 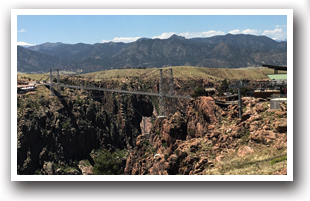 The Royal Gorge Bridge & Park is an amusement park along the edge of the Royal Gorge and is open daily. Be sure to stop and walk across one of the world’s highest suspension bridges! Your family will enjoy spending a day playing together: aerial gondola, plaza theater, historic artifacts, 17 minute video on the bridge and park, children’s playland, Royal Rush Skycoaster and Cloudscraper Zip Line. In summer there is a concert series. 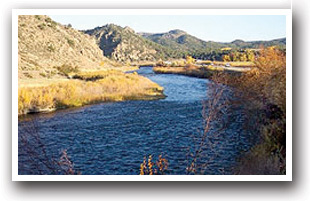 The Arkansas River also offers great fishing in the spring and fall seasons and rafting in the summer. Cotopaxi and Coaldale are popular launching pads to rafting the Arkansas River. Cañon City Whitewater Park is along a stretch of the Arkansas River; this park attracts kayakers, rafters, boogie boarders, and tubers. There are two features to this course: Flytrap and Nessman. Beginners will want to try Flytrap at lower flows before, as it can be a little tricky. This course is home to the Royal Gorge Whitewater Festival in June. 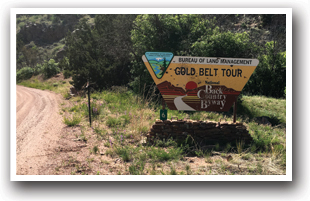 The Goldbelt Tour Scenic Byway runs all throughout this area. Some of the routes are more for the thrill seekers but there are some easier, more relaxed roads. Take the High Park Road to the Florissant Fossil Beds National Monument or head to Cripple Creek. Once a favorite camping area of the Ute Indians, both dinosaur bones and oil have been discovered here. Five miles north of the city is the Garden Park Fossil Area commemorating the 1877 dinosaur find. Another fun place to check out is the Indian Springs Trace Fossil Site. It is considered to be the best trace fossil locality in North America. 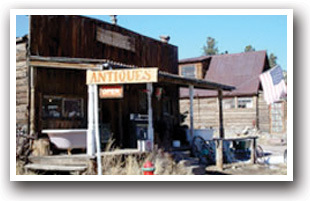 Guffey is a small mountain town less than a mile off Colorado Highway 9 surrounded by 25-miles of mountains and outdoor activities. Each 4th of July come and enjoy Annual Chicken Fly, with a "Chicken Drop," and the "Chicken Rollin' Alley." Other fun activities in the area include hiking the Rainbow Trail and Jeeping & ATVing in Texas Creek. Commercial air travel accommodations are handled by the Pueblo Airport. Please contact your preferred travel agent or airline for flight arrangements. The Royal Gorge Area is 45 miles west of the Pueblo Airport.